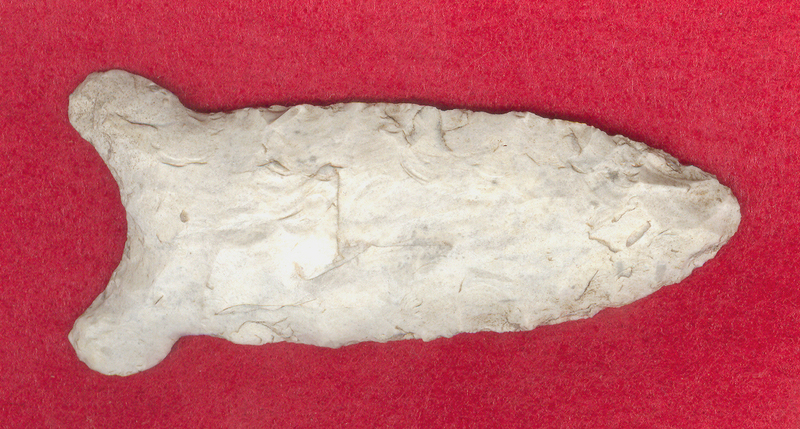 A Large Size, Visibly Heavily Anciently Use Sharpened, Well Made, Quad Point That Exhibits Surface Aging Sheen Frosting And Stone Coloration Patination, Correct Basal Stem Edge Hafting Dulling, Correct Aged Blade Sharpening Use Reduction, Aged Mineral Deposits, Correct Basal Thinning, Correct Material For The Area Found. Ex-Dennis Makovsky Collection. The Basal Ears Are Exaggerated Due To Heavy Blade Width Use Sharpening Reduction. This Very Nice, Collectible Example Was Found On The Extreme Westward Border For The Type, Often Found In Tennessee, Alabama And Kentucky. Includes A Ken Partain Certificate of Authenticity!